If Spotify Acquires Gimlet, What Does It Mean for the Future of Podcasts? Digital music service Spotify is rumored to be acquiring Gimlet, a narrative podcast network. 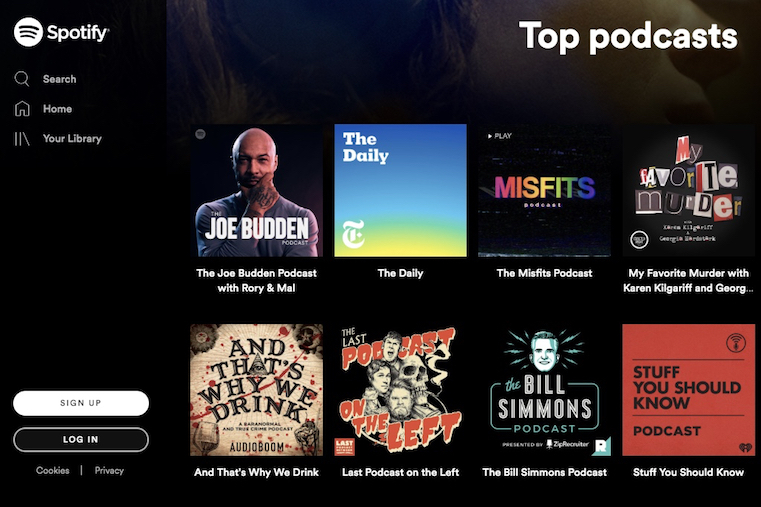 Over the past few years, Spotify -- which began as a music streaming service -- has been treading in the waters of the podcast realm, first by aggregating select audio content shows available elsewhere online on its platform. 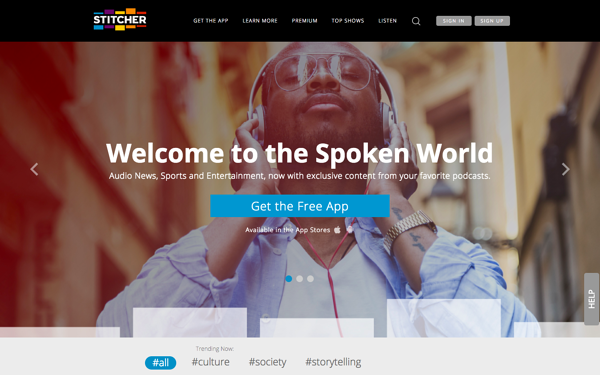 In 2017, the company began to produce its own own podcasts available exclusively on Spotify, and has soon reached agreements with such high-profile entertainers as Amy Schumer and Joe Budden to create such original content. Considering Spotify's seeming wish to expand beyond music streaming and further foray into the area of podcasts, the acquisition of an organization like Gimlet makes sense to many. The latter is known for producing and distributing original audio-narrative content like much of the exclusive podcasts developed for Spotify, and has also made select moves into television production -- potentially aligning with Spotify's somewhat quiet efforts to add video content to certain streaming songs. But as the tech industry looks to be moving toward something of a takeover of audio entertainment -- and a growing number of tech companies are leaning toward the "original content" side of production -- what could this acquisition mean for the future of podcasting, and the creators behind the content? 2018 saw some major moves in the tech industry's gradual (but still potential) takeover of audio entertainment, like music and podcasting. In the spring of last year, for instance, Spotify went public. It was also the same year that the company reached the aforementioned podcasting deals with Schumer and Budden. In early 2019, at the annual CES consumer electronics event, the category of "premium audio" saw something of a peak, with many high-end products on display boasting superior sound and a boost to productivity. And as for streaming -- a survey run by News & Trends by HubSpot in January 2019 found that 44% of respondents primarily consume music through either a paid or free/ad-supported version of a streaming service, such as Spotify. In other words: Audio and tech and rapidly crossing over, and show few signs of slowing down this hybrid activity -- which is where Spotify's potential acquisition of Gimlet shows a strong fit. 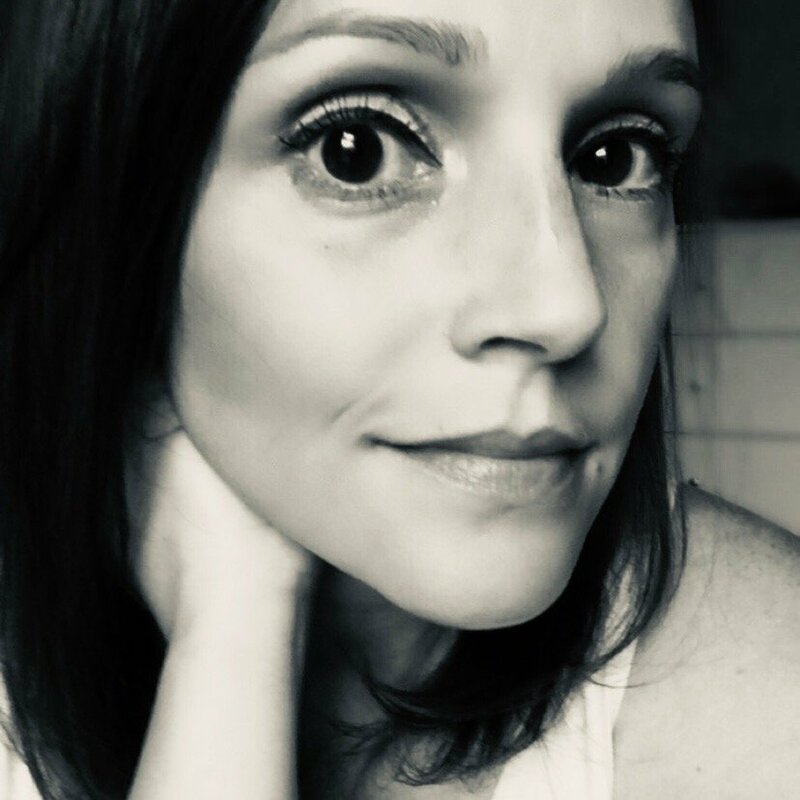 "Spotify is a tech company that focuses on acquiring new users and increasing the revenue each user generates," says Sam Balter, HubSpot's Senior Marketing Manager of Podcasts and host of Weird Work. "Acquiring Gimlet is a route to gain new users through exclusive to Spotify shows, which Spotify has done with their foray into original programming like Amy Schumer’s podcast and Dissect, a music podcast." Balter also points to findings that podcast listeners on Spotify spend more time on the platform overall -- potentially exposing such users to a higher volume of ads, or providing them with incentive to become paid, premium members. "The big question I have is: Will Gimlet content become exclusive to Spotify? If this is the strategy, it has the potential to rip millions of listeners from other podcast platforms and bring them over to Spotify’s ecosystem." With the prospect of also gaining Gimlet's audience of podcast listeners with an acquisition of the company itself, Spotify stands to increase its quantity of such users who spend more time on the platform -- carrying the same possible ad exposure and subscription incentives. But that benefit to Spotify isn't without issue to other podcast content creators and aggregators. "The big question I have is: Will Gimlet content become exclusive to Spotify?" asks Balter. "If this is the strategy, it has the potential to rip millions of listeners from other podcast platforms and bring them over to Spotify’s ecosystem." Since Netflix -- an online streaming platform for movies and TV shows -- began creating its own, original content exclusive to customers of its service, several other companies have worked hard to follow suit. Amazon, for example, began creating original movies and TV series for its Prime Video service. Hulu followed not long thereafter, and today, tech giants like YouTube and Facebook are promoting original content made exclusively for their respective Premium and Watch programs. But original podcasting has seen a smaller amount of attention, with most content being created by either public radio stations -- such as NPR's famed "Serial" -- or independent producers, whose shows could typically be found on such aggregate sites as Stitcher and iTunes. It was a system that created a democratization of podcasting: one that permitted anyone to become a creator, with some gaining a cult following of those who discovered content via the aforementioned distribution channels or word-of-mouth. But with the onset of larger tech companies -- many of which are well-funded, hence Gimlet's $200 million price tag, should Spotify acquire it -- either acquiring original content from other platforms, or creating it themselves, it begs the question: What becomes of independent podcasters, and the previous democratization of the category? "Spotify has the capital to do what it wants. [But] what I fear most is the privatization of podcasting, and the increased push towards monetization throughout the industry," says Matthew Brown, producer of such HubSpot podcasts as The Growth Show and Weird Work. "That doesn’t mean podcasts will go by way of the personal blog. But in due time, no one will care about an independent podcast, in the same way they care so little about a personal blog." However, not all is lost for independent podcast creators. Similar to the way musical artists use outlets like Spotify as a discoverability channel, so could these audio content producers -- should they find a way for their work to become listed on Spotify's platform. 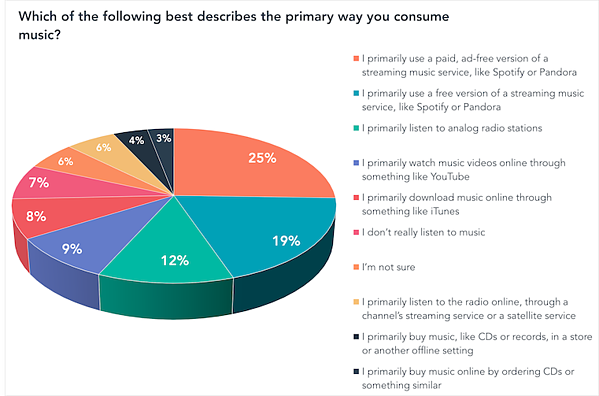 That pros-and-cons sentiment among artists toward streaming services was one that became prevalent while collecting data for the aforementioned music-consumption survey. "What I fear most is the privatization of podcasting, and the increased push towards monetization throughout the industry." At the time, said musician and artist Dessa Wander, "The blessings are considerably more mixed" as a creator. "Streaming services don't pay creators very well. And some artists worry about how streaming might influence the music itself -- albums are less likely to be listened to in one sitting and in sequence -- long intros might tax the patience of a browsing listener." Given the findings on podcasts listeners spending more time overall on Spotify, however, the fate could be different for podcast creators. Arguably unlike albums, for instance, podcasts tend to be episodic, thus providing listeners with a greater motivation to "binge-listen". And while Spotify's acquisition of Gimlet is still yet-to-be-confirmed, many within the world of podcasting still have concerns for how it could impact the creator community -- despite the potential benefits. "The potential acquisition of Gimlet by Spotify will most likely further the economic divide in podcast creators and push out the podcasting middle class," Balter explains. "It’s going to be increasingly hard for upstart podcast creators to get a show off the ground when huge tech companies are controlling both the content -- and the means of distribution." Spotify's Q4 2018 earnings report is scheduled for Wednesday, February 6 prior to the opening of NYSE markets -- where confirmation of such an acquisition could take place.